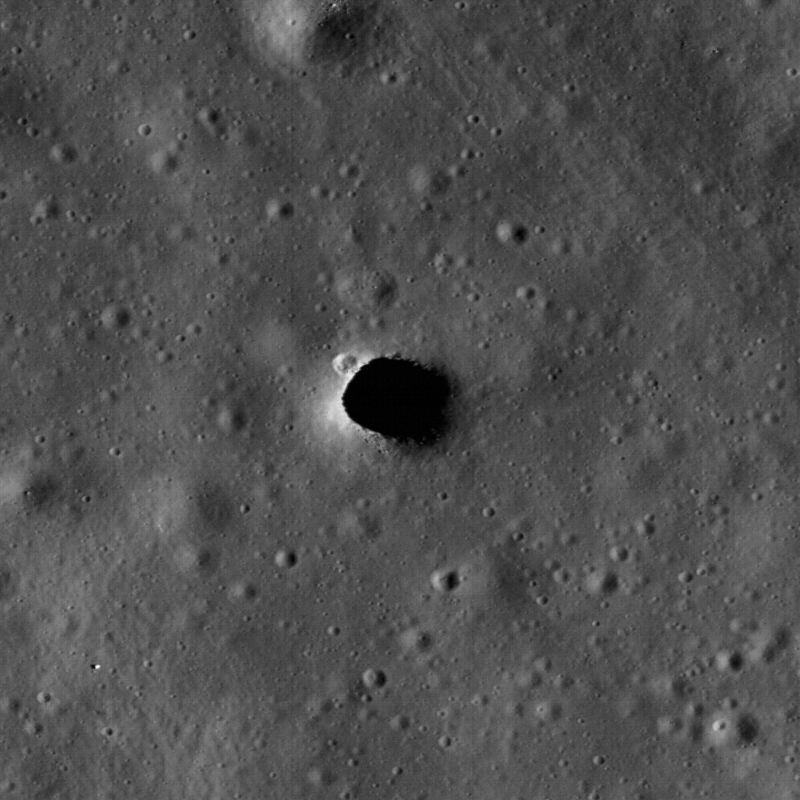 Follow-up observations of a potential ‘skylight’ in a lava tube on the Moon has revealed a cavernous lunar pit in the Marius Hills region, with a view of the interior and bottom of the pit. The sun angle, camera angle and lighting conditions were just right for the Lunar Reconnaissance Orbiter camera to look all the way down to the floor of the pit. And this is no small hole in the ground — the LRO team says this pit is about 65 meters in diameter! This latest image confirms this object is actually a subsurface cave; a lava tube close to the surface where part of it has collapsed. These lava tubes could be great locations for lunar bases that could protect human explorers from dangers such as cosmic rays, meteorite impacts, and the extreme temperature differences between the lunar day and night. This is the fourth time that this particular lunar pit has been imaged. Since LRO is constantly orbiting the Moon and it completes a full cycle of lunar imaging each month, the team can do follow up observations of previous discoveries and re-image targets under different lighting conditions. Previous images had revealed the dark, cave-like entrance, and another showed part of the pit wall. For this fourth imaging run, the spacecraft slewed 43° to the east and the solar incidence angle was 34° from vertical. This was just the right angle so that if there actually was an open lava tube extending horizontally its floor would be illuminated. The LROC team hit paydirt (or pay-regolith, if you will). With LRO’s Narrow Angle Camera, the team was able to image a few meters under the overhang to show the interior of this sublunarean void. With this oblique angle, they were also able to capture the layered nature of the mare bedrock in the pit walls. These exposed layers give scientists important clues as to how the vast mare were deposited. The collection of images now verifies this is actually a cavernous subsurface cave. These pits had been predicted to exist, based on the understanding of the geomorphology of mare deposits and lava flow behavior on Earth, but never directly imaged before. A graphic of the imaging geometry in cross section, which allows a view of the lava tube floor. Arizona State University. The LROC team will be presenting their findings about this pit and others that have been imaged at the Lunar and Planetary Science Conference. You can read their abstract here. (pdf file). See more about this new image at the LROC website. Groan! As if it wasn’t pit-full enough already. Volcanoes… But that was a while ago. See for instance http://en.wikipedia.org/wiki/Lunar_mare for more details. This particular spot is somewhere in the Ocean of Storms which is a mare.